Can these be mere coincidences or is there something more profound at work here? 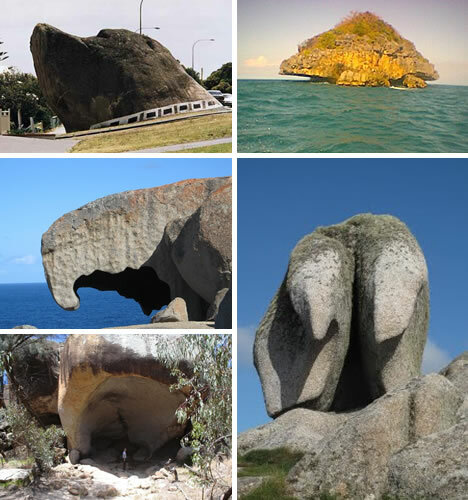 All around the world, boulders and other rock formations are naturally sculpted into all kinds of animal shapes. Over a mind-boggling number of years, wind, water, and other kinds of erosion have gradually brought these rocks to life, so to speak. Found in La Maddalena Archipelago, Italy, how can you not see a white polar bear sitting there? The slope of the back, the head and neck, and it even has two ears! Near an extinct volcano on the Easter Islands, lots of unusual forms appear. A river rock in Oregon’s Willamette River hides a giant snake! In Moab, Utah there’s a place called Hole in the Rock with weather-worn cat-like stone sculptures. And some kind of creature in Japan’s Matsushima Bay. Giant rock camels were found in the deserts of New Mexico, Arizona, and in Cappadocia, Turkey. The last one in Illinois’ Garden of the Gods, is missing its head because vandals destroyed it. Top left: Pt. Reyes National Seashore, California. Middle Left: Queen Valley, Arizona. Middle Right: Elephant Rock, Prince Edward Island, Canada. Arizona’s Monument Valley is home to more examples of these natural beauties.